I am always looking for posh ways to travel without looking like a bag lady and the holiday season is no exception. Enter my current travel lust item. 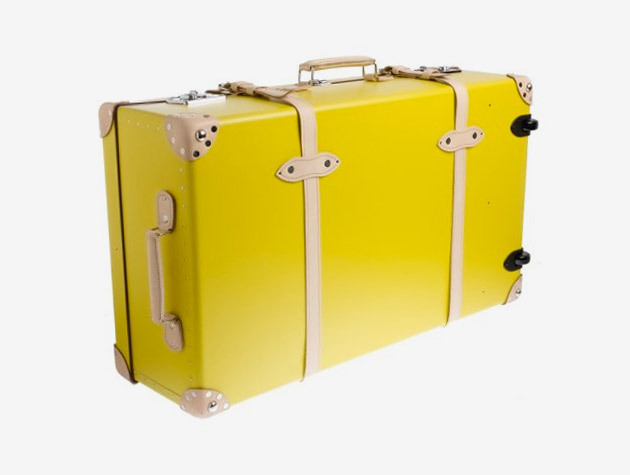 Although, my current fashion preferences lean toward leather and lace there is something appealing about how opposite all of that this suitcase is. Fashion "split personality" moment. Globe-Trotter designed this beauty specifically for JCrew. The practicality of it lends itself more to private jets I think, but the site says the beautiful yellow exterior (which does come in black btw) will survive most anything...even a one-ton elephant sitting on it? Stay posh!